At Belmars, we are dedicated to improving the quality of life of people living with Parkinson's Disease. Rock Steady Boxing was founded on that premise. We are here to help give you back your quality of life with specialized classes designed to meet the needs of someone with Parkinson's. Parkinson’s affects many aspects of the brain and produces many symptoms, such as balance issues, coordination problems and difficulty with movement. 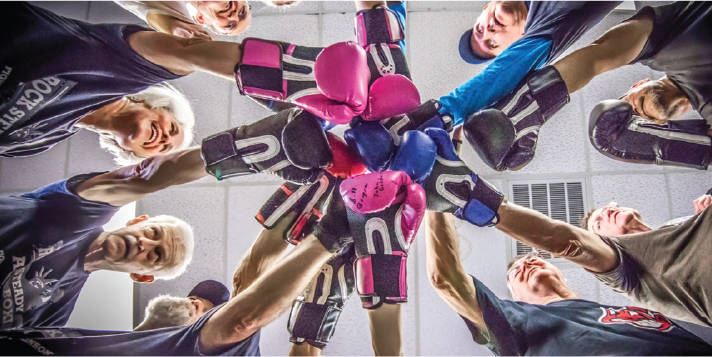 Now, these factions are what boxing training aims to improve, as well as to enhance general health and well-being, which is contrary to the treatment you may expect a Parkinson’s disease victim to partake in. I should add; these boxing classes are strictly non-contact, so they just place emphasis on improving the body and brain’s functioning to soften the symptoms.